The presence of Filipino Americans in Hollywood is an issue close to my being. On May 31st, there was a panel hosted by Fil-Am Creative regarding this very subject. Fil-Am Creative is a collective of actors, writers and producers who strive for their voice to be heard in the Hollywood minefields. How do we navigate in this minefield? This is a daunting task for anyone who attempts to make it in Hollywood. But imagine Filipino Americans trying to make it? We are background players in the big budget movie entitled “Hollywood” functioning as gaffers, writers and producers, but fuh-get-about being on-screen! There have been tangible strides made in TV with actors like Angela Relucio on CBS’s “Code Black”, Manny Jacinto on NBC’s “The Good Place,” and Aina Dumlao on CBS’s “MacGyver”. They are working in Hollywood, and I know just having a regular acting gig deserves a round of applause! But…they play characters written through the lense of the Establishment (yes, I capitalized the E on purpose, so take that blog copy editors!). What about our stories? Our perspective? This is why I love knowing Fil-Am Creative exists. Youtube channels, television pilots, short and feature films are being made and looking for support, created and influenced by talented Filipino-Americans who deserve their voice to be heard. Fil-Am Creative provides a platform to be heard. Filipinos have a diverse set of perspectives that need a place to be heard. Filipino immigrants have a different viewpoint than third or fourth generation Filipino Americans. We are such a diverse group. Muddling through this diversity within ourselves is a challenge in itself. A support group like Fil-Am Creative can recognize these differences (thank God!). For me, it’s a big sigh of relief knowing there is a movement of Fil-Am stories being told in the shadows of Hollywood’s elite. I was lucky enough to meet a few people behind the scenes of this organization. My first thought: why didn’t I know about them before? Let us not lose sight of one thing; a movement cannot be just one feature or one short. We must have a series of “quality” projects that allows us to be self-sufficient. Hmmm…I feel like I’m posting a car-ride lecture to my kids! Now I feel their pain. Let’s. Not. Stop! More Fil-Am content please! 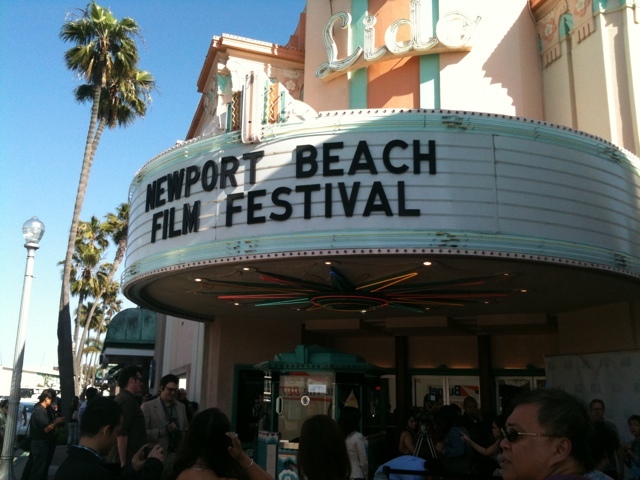 Pacific Rim Video covers the Subject: I Love You premiere at the Newport Film Festival. I had a great time and want to thank Director Francis Dela Torre for his hospitality, and for making a film that I think Filipinos will be proud of…and I predict it will crossover to a mainstream audience! You heard it here first! The premiere was a smashing success! Went down to Southern California to support friends who produced the film Subject: I Love You, premiering this weekend at the Newport Film Festival. In my eyes, this is the first film since The Debut that will affect the Filipino American community on a grand scale, so here’s to hoping it does well! In the meantime, everyone is celebrating the film’s premiere and I’m having a good time meeting Hollywood folks! And hopefully this post comes out okay since I’m typing this on my iPhone.